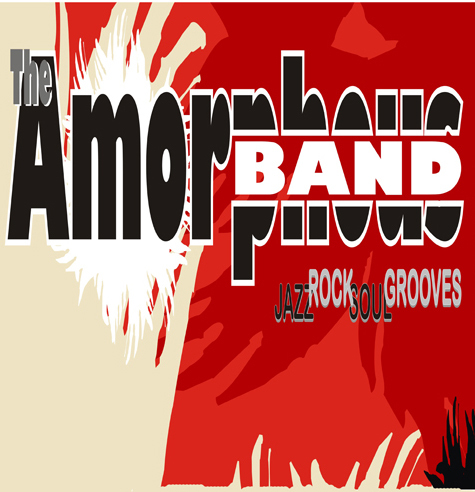 The Amorphous Band was “formed” in 1995 to create a community of musicians to produce an ever changing core of material and present it in many musical formats. Each player brings a sound and a soul to the band and helps transform the music while a signature quality unites it all and brings form from chaos. The current line-up features the hard soul vox and drums of George Laliotis with the rock solid bass grooves of Chris Noyes. Chris Sink takes keyboard duties while soul queen Gina Alibrio makes the scene on lucky occasions. Founder Chris O’Neill on electric guitar is the ever present force behind the scenes. In 2016, our guest in residence is the brilliant guitarist Sky Rubins. Over the years the band has shared the stage with Soulive, Tim Reynolds, The Headhunters, The New Deal, PBS, The Duo, Sam Kinninger Band, Jacob Fred Jazz Odyssey, Percy Hill, Moon Boot Lover and many more. They have won the reader’s poll award for best jazz band in the Portland Phoenix, Jam Magazine and the Portsmouth Herald five times earning them the Hall of Fame status. During residencies at various seacoast NH clubs literally hundreds of musicians have come on and off the stage to the delight of fans who have come to expect the unexpected. The band goes in between late night music festivals, clubs, jazz brunches, weddings and parties of all stripes with ease and sometimes all in one day. Maintaining a full time calendar that brings them all over New England and beyond, they can be found wherever people want to hear that distinctive sound and feel the groove of the Amorphous Band.